Compact, powerful and built to last, the most affordable scanners mean no compromises. Designed to handle paper sizes up to A3 and cope with low or large paper volumes right up to the recommended maximum of 20,000 pages per day, the Kodak i3000 Series Scanners are ruggedly built to deliver consistent throughput and uptime - perfect for office environments where reliability, performance and image quality are key. And given the ever increasing demand on budgets and need to deliver return on investment from IT spend, the i3000 Series Scanners are competitively priced and come with a one year onsite warranty. An upgrade to the Perfomance Plus service contract is also available. Petite dimensions. 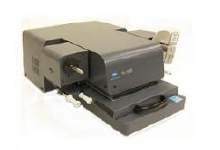 Powerhouse performance - The Kodak i3000 Series Scanners are compact and measure just 43 x 37 cm. Users benefit from two paper path options: rotary or straight through. This means that long (up to 4.1 metres), thick or unbendable documents can be catered for without risk of damage. An optional post scan rear-side imprinter is also offered as an option should you need to prove that documents have been successfully scanned. All Kodak i3000 Series Scanners come bundled with Kodak Capture Pro Software Limited Edition and are compatible with Kodak Asset Management Software. The Kodak i3000 Series Scanners. Powerful. Compact. Affordable. And built to cope with whatever you throw at them. 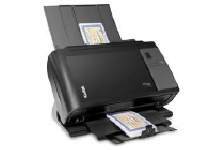 - The Kodak i3200 is designed to handle 50 pages per minute. 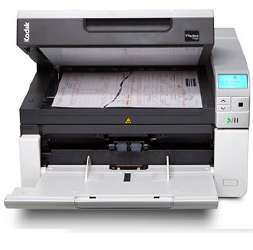 - The Kodak i3400 is rated at 90 pages per minute for customers with greater document volumes. - The i3250 and i3450 scanners feature an integrated DIN-A4 book edge flatbed for bound, stapled or exception items.